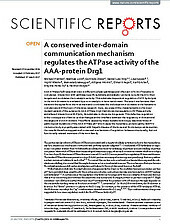 A conserved inter-domain communication mechanism regulates the ATPase activity of the AAA-protein Drg1. Valentin Mitterer, Nadine Gantenbein, Ruth Birner-Gruenberger, Guillaume Murat, Helmut Bergler, Dieter Kressler, and Brigitte Pertschy. In our previous study we showed that Rps3 forms dimers, and that Yar1 is bound to only one of these two Rps3 molecules in vivo. Here, we investigated the nuclear import of this intriguing complex. Interestingly, the nuclear localization sequence of Rps3 is directly adjacent to the Yar1 binding site in the very N-terminal part of Rps3, and Yar1 competes with importins for Rps3 binding. 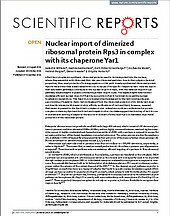 Still, we found complexes containing Rps3, Yar1 and importins in vivo, suggesting that Rps3 can be imported in a complex containing importin bound to one Rps3 molecule and Yar1 to the second Rps3 in the dimer. Valentin Mitterer, Guillaume Murat, Stéphane Réty, Magali Blaud, Lila Delbos, Tamsyn Stanborough, Helmut Bergler, Nicolas Leulliot, Dieter Kressler and Brigitte Pertschy. 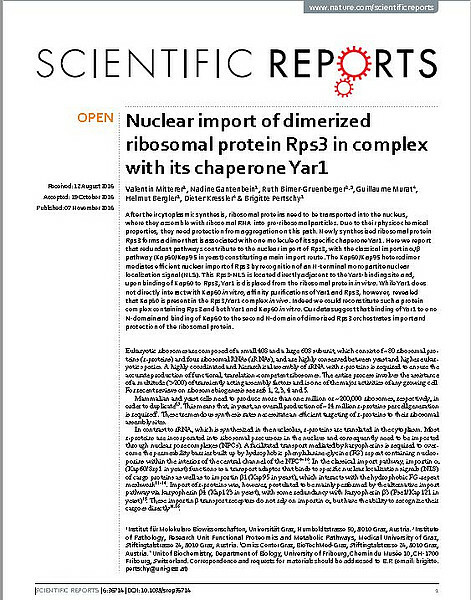 In this study we report the intriguing stepwise assembly mechanism of ribosomal protein S3.S3 is imported into the nucleus in a dimeric conformation with it's N-domain rotated relative to the C-domain and bound to the chaperone Yar1. Initial assembly of S3 with 40S precursors occurs via its C-domain, while the N-domain protrudes from the 40S surface. Yar1 is replaced by the assembly factor Ltv1, thereby fixing the S3 N-domain in the rotated orientation and preventing its 40S association. Finally, Ltv1 release, triggered by phosphorylation, and flipping of the S3 N-domain into its final position results in the stable integration of S3. 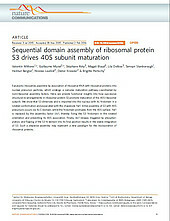 Ribosomal protein S3 interacts with the NF-κB inhibitor IκBα. Tamsyn Stanborough, Johannes Niederhauser, Barbara Koch, Helmut Bergler and Brigitte Pertschy. We previously showed that yeast Rps3 interacts with the ankyrin repeat protein Yar1 in the course of the ribosome biogenesis pathway (see below, Koch et al.2012). Here, we made the exciting discovery that the human Rps3 protein also interacts with an ankyrin repeat protein, the NF-κB inhibitor IκBα. We suggest that, while the interaction of yeast Rps3 with ankyrin repeat proteins ensures that enough Rps3 is provided to the ribosome biogenesis pathway, the interaction of human Rps3 with IκBα ensures maintenance of an Rps3 pool for the NF-κB pathway. In this study we characterized the mechanism of action of diazaborine, which is until now the only known inhibitor of eukaryotic ribosome biogenesis. We discovered that diazaborine specifically binds to the AAA-ATPase Drg1 and inhibits ATP hydrolysis. This blocks release of Rlp24 from pre-60S particles by Drg1 (see also below, Kappel et al. 2012), thereby inhibiting the progression of ribosome biogenesis. Lisa Kappel, Mathias Loibl, Gertrude Zisser, Isabella Klein, Gernot Fruhmann, Christof Gruber, Stefan Unterweger, Gerald Rechberger, Brigitte Pertschy and Helmut Bergler. The pre-60S component Rlp24 accompanies 60S precursors from the nucleus into the cytoplasm. In this study, we discovered that in the cytoplasm, Rlp24 is bound by the AAA-ATPase Drg1. This interaction stimulates the ATPase activity of Drg1, which is utilized to release Rlp24 from the particle. This release is a key event in large subunit formation that is a prerequisite for further progression of cytoplasmic pre-60S maturation. Jochen Baßler, Isabella Klein, Claudia Schmidt, Martina Kallas, Emma Thomson, Maria Anna Wagner, Bettina Bradatsch, Gerald Rechberger, Heimo Strohmaier, Ed Hurt and Helmut Bergler. Ribosome precursors are assembled in the nucleus and after a series of maturation steps, they are transported through the nuclear pores into the cytoplasm, where they undergo final maturation. In this study, we discovered, that Bud20 is a shuttling factor that accompanies pre-60S particles through the nuclear pore and is necessary for efficient export of the particles. We suggest that the function of Bud20 is to facilitate pre-60S export. Barbara Koch, Valentin Mitterer, Johannes Niederhauser, Tamsyn Stanborough, Guillaume Murat, Gerald Rechberger, Helmut Bergler, Dieter Kressler and Brigitte Pertschy. 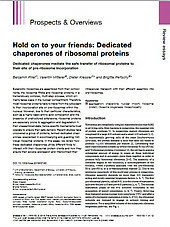 Ribosomal proteins are synthesized in the cytoplasm, but most of them assemble with pre-ribosomal particles in the nucleus. 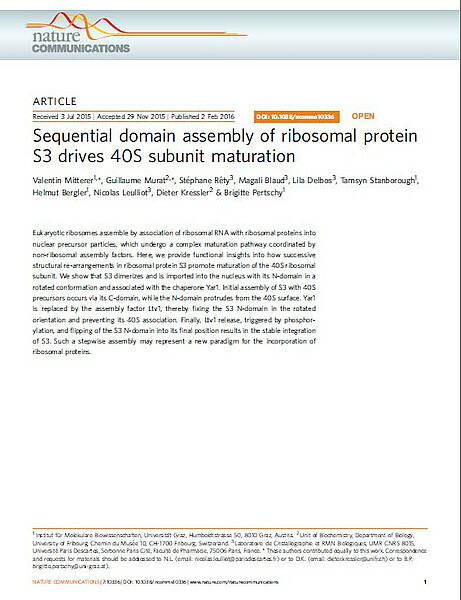 Here we discovered that the ankyrin repeat protein Yar1 binds to the ribosomal protein Rps3 and acts as a specific chaperone for Rps3 that ensures its solubility on the path to its assembly site. 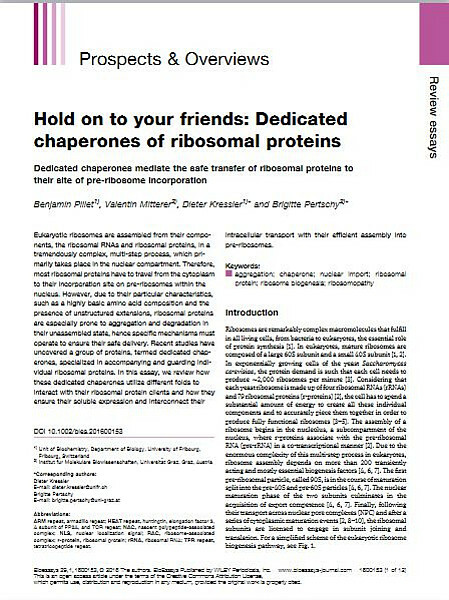 Our results open the possibility that protection of ribosomal proteins by specific chaperones might be a general mechanism that ensures optimal rates of ribosome biogenesis. Dieter Kressler, Ed Hurt, Helmut Bergler and Jochen Baßler. In this review, we summarize the current knowledge on Rea1, Rix7 and Drg1, AAA-ATPases which participate in ribosome biogenesis. All three proteins function in the release of non-ribosomal proteins from pre-ribosomal particles. We propose the model that in the course of substrate release, the force generated upon ATP hydrolysis triggers major transitions within pre-60S particles, which are essential for downstream maturation processes. Brigi tte Pertschy is portraied in the Austrian newspaper "Der Standard".